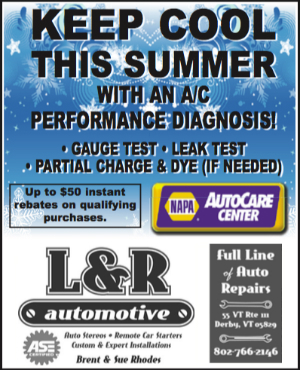 For 28 years, L&R Automotive, inc., on Route 111 in Derby, Vermont, has been offering a full line of automotive repairs and foreign and domestic vehicle servicing. We specialize in computer and electronic diagnostics, as well as sales and service of automotive electronics and remote starters. Owners Brent and Sue Rhodes and technicians Chris Russell and Brendon Rhodes provide quality service, certified technicians, and Auto Value Nationwide warranties for 24 months or 24,000 miles.